Wednesday September 12, 2018-A section of Orange Democratic Movement (ODM) leaders from Nyamira County have asked President Uhuru Kenyatta to sack his Deputy William Ruto since he is a major impediment in the ongoing war against graft. 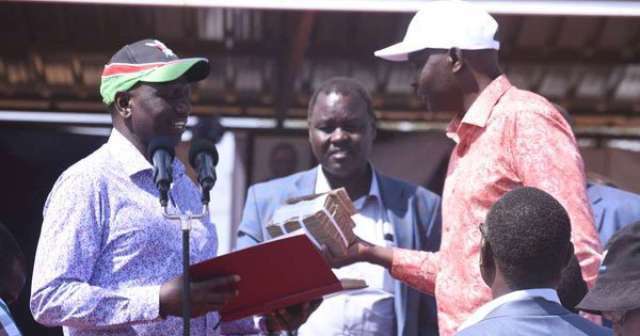 Speaking on Wednesday, the leaders, led by Nyamira County ODM Chairman, Richard Kaka, said Ruto should be sacked since he is frustrating Uhuru’s war against corruption. Over the weekend, Ruto scolded NASA leader Raila Odinga when he said most of the taxpayer’s money is lost through corruption. But in a rejoinder, the leaders defended Raila and said Ruto is denying the obvious because he is the chief priest of corruption in Kenya. “Time has come to cut ties with him completely," Kaka said. “Time has come for the President to be bold enough and kick him out."